As a nation we have grown so independent of everything that we are no longer an independent nation but an indifferent nation. We have slowly and steadily got used to the idea of Independence over the last many years. We now have achieved Independence from all things on which we were dependent earlier, like our families, natural resources, culture, traditions, leaders to a million other things. We have become so independent today that all we are left with is a sense of cynicism and ridicule, more so among the younger educated generation that is being fed a constant dose of sarcastic humor about the idea of India. So what happened to us? Allow me to dig a little deeper. Independence has become a tricky word nowadays; it is in fact making us carbon copies of each other. We watch the same TV programmes, read the same books, watch the same films, read the same newspapers, dance the same way, wear the same branded clothes, we even eat the same junk food, we are not that different anymore. We are increasingly becoming products of a cookie cutter society, look at the apartments we live in; the furniture we buy, they are the same anywhere you go in India. I don’t have to specify any further examples; you can pick some yourself if you look around. So if we are so much in dependence with changes in tune with the rest of the world where does the question of indifference arise one might ask. I came across this message recently on twitter and thought it is apt with the state of our nation and our false sense of pride in our history. Culture must be like tree whose leaves flutter and branches bend to winds of change, but roots stay strong. How much farther away from the truth are we with regards to the above statement? We have not only let our leaves flutter and branches bend but also have been doing something far more dangerous than that. We have allowed our trees to be cut and sold as commodities; we are no more concerned about our roots as we have put the tree itself at stake. Like that famous line from the movie Seven Samurai, we are bothered more about our beard when in fact it is our head that is at stake. Think about it, where are the best brains from our country heading to? It is too obvious a question with too obvious an answer. Out of 60 people from my batch in college almost 55 live abroad today. Same is the case with most college students today too. They have become so independent now that it is a matter of indifference for them whether the beard is cut or the head is cut. They have lost their roots forever and we have lost the potential to grow a great fruit bearing tree. All they can do today is maybe update their facebook status message with a Happy Independence Day message or tweet the same. We have lost them forever. But what about the rest of us who are still in India, are we doing enough to make our country proud? As a nation we have become so accustomed to passing the blame and pointing fingers that we hardly ever look at ourselves and ask if we have done enough for this country before talking of its problems. After all we forget that the basic building block of a society is an individual. It is very convenient to say that we pay our taxes and the government has to do the rest. It is as if the government is an alien creature that can’t connect with us. Take the case of the preparation for the commonwealth games. Every single citizen of this country has been either crying hoarse or showing abject indifference to the way things are being handled. Media on their part are highlighting the issues which they are rightfully doing so. But is that enough, is it enough for us to just look at the rot and revel in glory with that smirk on our face saying, I told you so, I knew it would be a disaster. We only talk and rarely act. Have you ever wondered why we don’t act? To understand the psychology of our citizens and to know why we don’t act, we need to first take a look at our history and look at one particular man who changed the destiny of this nation, the great Mahatma Gandhi. During the British rule the one magic mantra that worked wonders and left the British clueless was the concept of Non Cooperation. This in turn also gave rise to the phenomenon called bandh. Yet curiously he also propagated an idea called Swaraj, which meant being self sufficient. But in our increasingly modern consumerist world Swaraj is just a myth. In the absence of Swaraj the meaning of a bandh has changed totally. 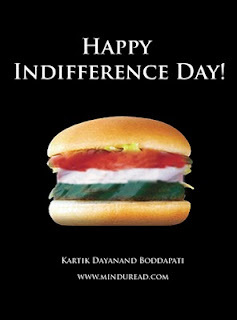 A Bandh today is nothing but a display of indifference. If we think bandhs are enforced by political goons on us today by force, the educated elite also have their own form of remixed protest called a candle light vigil. How convenient, just don’t do anything and expect the government to wake up. It might have worked during the British rule but not anymore. Now one may ask, but how do we show our displeasure and wake up the government from its slumber. How do we break this chain of independence between the state and its subjects? Surprisingly the answer to this lies with the great Mahatma Gandhi again. He said, if someone hits you on one cheek then show him the other cheek. This simple grain of thought led to the production of the immensely successful bollywood movie called Lage Raho Munnabhai with its concept of Gandhigiri. If non cooperation was the mantra during freedom struggle then the solution to our current day problems lies in the cooperation movement aka Gandhigiri as shown in the movie. Every day I drive around Delhi roads. I look at the rubble everywhere and wonder how I could help those hapless workers and their supervisors toiling in the sun fixing the mess. They are doing a tough job and are at no fault for all the delays. I feel the same when i see something that is not being done right around us. Instead of sniggering at the rubble or the troubles, what if we become one of them or simply just stand there and encourage them and tell them they are doing a great job and we are with them, how much of a difference would it make to their morale? They say faith can move mountains and we are after all talking about completing a few stadiums. It’s time to stop our non cooperation movement and start talking about real cooperation. As much as we need the government, the government also needs us. Don’t forget that people working in government jobs are called government servants and politicians are called public servants. When the servant doesn’t turn up don’t we take up the broom to set things right in our house? It’s time we did the same with our society too. So let’s stop talking and start acting. Going forward, every year after the Independence Day on August 15th, lets pause and reflect to see if we are truly an independent nation or still the same indifferent nation. I have my plans in place to clean up the mess we are in, shall share more about that in my future blog posts. You keep your plans ready too, leave your suggestions in the comments section below. Its time we did something worthwhile to call ourselves Proud Indians. Commonwealth Games 2010: A Plumbing Problem!